Sustainable, sustainability… these are catch-words we tend to hear a lot of these days in the news or in trendy shops. There is a lot of chatter on the Internet (here I am) about it. In advertisements, corporate statements, etc. I think it’s great, but I have noticed we tend to hear less about being self-sufficient. Self-sufficient and self-sufficiency are wonderful words with a sense of empowerment contained within them. It’s something that seems to be forgotten and certainly isn’t talked about much in our consumer society. When I say self-sufficient I don’t mean living off grid in some great wilderness, though at times this does have an appeal. It’s more of providing for yourself without needing an outside source for your survival or at least, less from an outside source. Being self-sufficient is not only economical, but brings a sense of well being and accomplishment, and it uplifts you. Being self-sufficient to me isn’t about disconnecting from society, but rather providing some of life’s necessities through our own means and spending less money in the process, which these days there never seems to be enough of. As stated earlier it gives you a sense of accomplishment, which makes you feel good. We hear about so much depression today and a sense of disconnect from life that people turn to synthetic drugs for help, which the pharmaceutical companies are all too willing to provide for a price. The thing is they don’t help you because they only mask the problem. 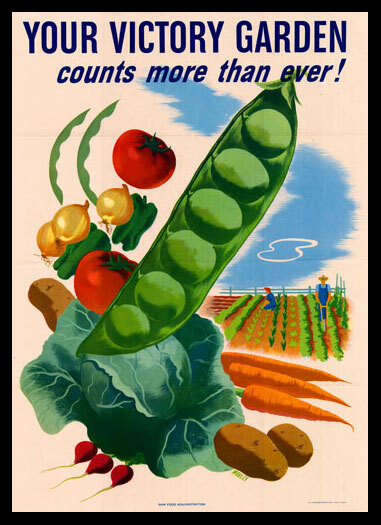 In the days of World War II people were self-sufficient. I think it was partially because it was a time when there wasn’t a shop for everything. Also it was because of rationing. People grew Victory gardens and had chickens and bees in their back gardens. It was accepted and expected. You were not doing your part for the war effort if you didn’t and rations only went so far. How far have we come as practically everything is available in a shop or even online. We have been raised to think the most natural things such as gardening, raising chickens or bees is out of ordinary or odd, but we don’t think twice about spending our hard-earned money at a shop for over-priced necessities. In fact we are expected to do so. Laws have been passed in various communities preventing you from raising chickens or from having a garden. It’s a sad state of affairs because these laws are designed to disconnect you from nature and encourage you to spend your money to fuel the system. If more people would turn back to the earth, grow a garden, try some carpentry, or mend a sock our lives would improve. Being involved in providing for yourself in practical ways will change your life. I love how this family living close to Phoenix, Arizona purchased a home and converted the old swimming pool to an aquatic garden. I think it’s the ultimate in sustainability and self-sufficiency.